The shock and trauma from the images and stories from Aurora are still very much with us, and it is impossible to put into words the pain being felt by families and friends of the victims. Obama's recent statement suggests he may be ready to do so. Thanks! Your signature has been submitted. We can only hope.... such stupidity. Already signed. Thank you for posting. Signed & Noted. Thanks so much for posting, Kelly! This ban was law from 1994 to 2004 when it expired and wasn't renewed by Congress due to heavy "lobbying" by the NRA to members of Congress from both parties. It should be a "no-brainer" getting it reinstated. Hunters don't need assault weapons. It's definitely past time for the people's voices to be heard. I'm much more for instituting proper weapons use training nationwide, scrapping idiotic gun control, smashing that stupid sculpture, and exiling the anti-gun lobby whose actions I consider as contributing to the Aurora shooting. Thanks Kelly. Signed. Isn't it about time America banned ALL guns without exception? The 2nd amendment is way out of date and quite absurd. Taken literally it suggests that anyone, sane or insane, is entitled to arm themselves with anything including tanks, missiles and nuclear bombs? Wake up America the world is laughing at you and your all powerful gun lobbyists. America IS the "Wild West," and the macho men want to control everything and everyone. 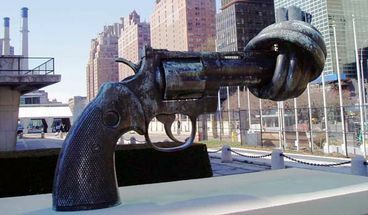 Guns are weapons of mass destruction and kill thousands of people daily worldwide. How wonderful is that!! Guns belong in the military and police force for security. NOT in people's living rooms, bedrooms, kitchens, pants pockets, or anywhere else. One day there will be no congress, no president, no legislative bodies --- they'll all be dead. And civilization will revert back to the stone age. Thanks to the despicable leaders of the NRA (who ultimately will be buried with their guns in hand). One can only hope that the next time anyone orders 6,000 rounds of ammo, someone will think about the harm and devastation it can cause, and NOT JUST THINK ABOUT THE MONEY. I realize that's asking a lot in the Wild West: Land of Greed and No Conscience.